Hip Hop for babies? I know, I know. Sounds a bit out of the ordinary. But this DVD just goes to show you shouldn't judge a DVD by its title. Believe me, It's Hip Hop Baby will get your small kids moving and grooving to a boppin' beat. The award-winning It's Hip Hop Baby DVDs help children learn through music and movement. Candi Carter, a mom, came up with the idea out of necessity. Her young son had speech delay issues and she discovered that she could best communicate with him through song, singing him melodies and rhymes to a hip hop beat. A true "Mom-Prenuer," she quickly realized that other kids could benefit from her music and developed the energetic It's Hip Hop Baby products. Clips of children talking and participating in various activities are interspersed between the songs. Baby, my kids really loved hip hopping to the beat! The DVD kept both my preschooler and my one-year-old's attention the whole way through. I don't think either of them sat down while watching the high energy songs. The It's Hip Hop Baby website states that the video is geared toward ages 2 to 6. I think toddlers would most benefit from watching and interacting with It's Hip Hop Baby! : All Your Child's Favorites . Even my one-year-old caught on really well to some of the songs, especially Animal Fun. He made the cow and duck animal sounds right along with the kids on the TV. So cute!! In March 2009, It's Hip Hop Baby released three additional educational DVDs: Get Healthy, Get Fit , Things We Do Everyday , and Rockin' Dance Party! , and a music CD (Fruit! ). The full product line is available in stores now. WHEW! This post contains a whole new batch of winners selected using random.org (click on the images to view the draw and timestamp). All will be notified by email and have 72 hours to contact me before another winner is chosen. Thanks so much to everyone who commented. Keep up the comments -- more giveaways, join me next week in participating in Mom Most Traveled Give It Away Blog Carnival! 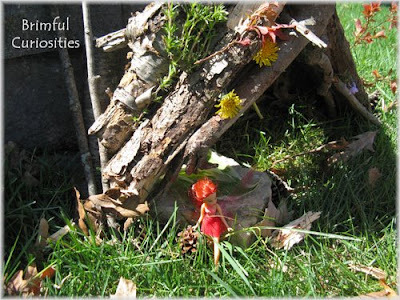 Yesterday we built a fairy house out of natural materials we found in the woods. Looks like it already has an occupant. Want to build your own? Lots of fairy house fun at The Fairy Houses Series and Family Fun: Fairy Houses Craft. For a second year, Reading Is Fundamental (RIF) and US Airways are working together to help children nationwide discover the joy of reading. Starting April, adults are invited to join the 2009 Read with Kids Challenge and help collectively log 5 million minutes spent reading with kids. You’ll have the chance of winning a family vacation to the Walt Disney World Resort® and more great prizes. Get on board! Visit www.RIF.org/readwithkids today. I know that some people found the whole media blitz regarding the Obama's search for a puppy a little much. I personally liked hearing about their search and loved learning a few weeks ago that they adopted a Portuguese water dog, naming him Bo. Those that like hearing about Bo must read this adorable children's picture book that tells the story of a special fictional puppy with presidential hopes. In the book, First Dog, a black puppy feels lost without a home. Ready for an adventure he sets out on a worldwide trip in search of the perfect place to live. He visits countries all over the globe and meets many different types of dogs but none of the places feels like home. Sad and tired he ends up back where he started. By accident he happens upon a newspaper article about a very important family looking for a dog. 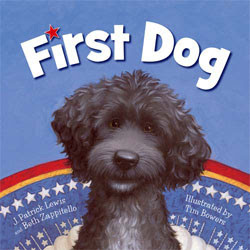 With hopeful stars in his eyes he makes his way to a big, white house in Washington, D.C.
Father-Daughter duo J. Patrick Lewis and Beth Zappitello bring readers an interesting and fact-filled story about a lonely globe-trotting dog with their perfectly timed release coinciding with the White House dog announcement. Tim Bower's cute illustrations (created using oil paint on canvas) perfectly capture the innocent puppy expression, depict many famous landmarks around the world and creatively include some newer technologies like the Segway. Besides the current events connection, this book makes a great adopt-a-pet read. It makes me want to go to our local shelter and find a new friend for our family. Sunny days - Time to say goodbye to coats and mittens. Hello, sunscreen! With my pale, sensitive skin I'm always on the look-out for great sunscreen products. Without sunscreen I turn a nice shade of red in a matter of minutes. My family recently had the chance to try out a non-aerosol kids spray sunscreen by KINeSYS. Typically, we use a lotion sunscreen so using this particular type was a whole new experience. The product sprays on a lot like water in a spritzer. I found that at first when you apply it the sunscreen feels slightly greasy but after it dries, you can't tell you have sunscreen on at all. To apply I held the nozzle 6-8 inches above the skin, depressed the sprayer and moved the container in a sweeping motion over the skin. To apply to the face, all I did was spray a little on my hand and rub it on. (Please refer to manufacturer for complete instructions and product information KINeSYS application demonstration video) It takes a few minutes for the product to dry. The 4-oz bottle is designed to fit comfortably in your hand. The manufacturer suggests that you apply the sunscreen 30 minutes before sun exposure. My kids loved getting sprayed! My one-year-old laughed like someone was tickling him and every time he sees the KINeSYS bottle he wants me to spray him. We've only had two nice sunny days here since we received the product in the mail, but in our trial runs no one ended up with a sunburn after using the product. I noticed that I did have to pay close attention while I was applying the product to make sure I covered all areas of the skin. I imagine with practice the application process will come more naturally. We also had the opportunity to try the new Girls SPF 30 Sunscreen with a light vanilla and green tea scent. My preschool daughter of course loved the pink bottle and liked having her "own" sunscreen. I'm not usually a big fan of scented products, but I do like the way this one smells girly without being too strong. I'm interested to see how both products fare at the pool this summer. My favorite attribute? According to their website, the KINeSYS company says they produce a safe sunscreen and care about the environment. I never realized that some sunscreens contain undesirable ingredients. KINeSYS received the #1 rating for spray sunscreens by Environmental Working Group for high-efficacy/low-hazard ingredients. Check out the Environmental Working Group sunscreen database for further information. KINeSYS products do cost a little bit more than your standard sunscreen, but the ease of use and environmental benefits help make up for the extra cost. Try it out! 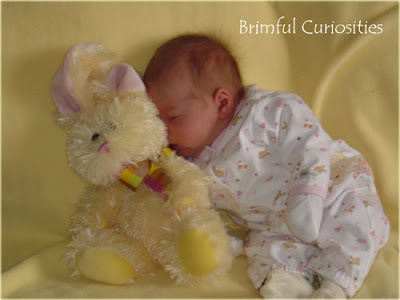 KINeSYS is offering Brimful Curiosities readers a 10% discount on their orders. Use Code BRC10 (includes free shipping on orders over $45 AFTER the discount). 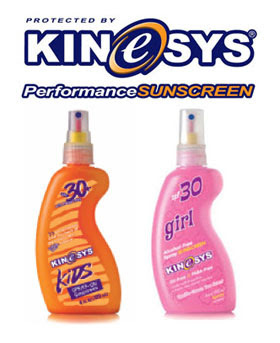 KINeSYS has kindly offered to give one Brimful Curiosities reader a 4oz Kids Sunscreen & 4oz Kids Moisturizer. To enter, visit KINeSYS and leave a comment letting me know which KINeSYS product you think would best meet your family's needs. 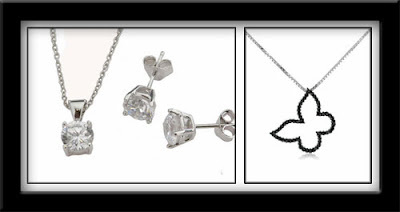 • Contest ends on Monday, May 4, 2009 at 11:59 PM CST. Thanks to Family Review Network and KINeSYS for this review opportunity! How often do you step outside and wonder at the beauty of nature surrounding you? Some days when I am busy or struggling with life, I hardly take notice of God's creation - the wildlife, the plants and trees, the sky, the lakes, the seas. Earth Day helps remind us to take a look at the natural world and take steps to protect it. 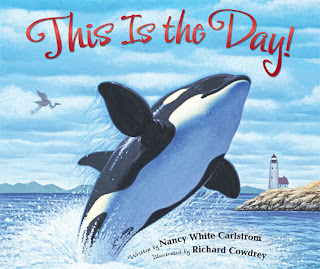 Nancy White Carlstrom's newest children's book titled This Is the Day! also serves as a reminder and calls readers to rejoice, give thanks, and celebrate the beauty of God's creation every day of the week. Inspired by the beautiful San Juan Islands and the Bible verse Psalm 118:24, Carlstrom, using poetic text, rejoices in the many beautiful animals and places found in the great outdoors. Each page features a different day of the week from Monday to Sunday and asks readers to rejoice and sing along with all God's creatures. The marvelous page-spread nature illustrations by Richard Cowdrey, full of color and life, make you feel as if you are standing outside viewing the sights instead of just reading a book. See one of my favorites, a deer reaching for an apple pictured below. My daughter enjoys trying to identify all the animals including eagles, a red fox, birds, and orca whales and she especially likes the page with animal cloud shapes in the sky. Some reviewers argue the book may take Psalm 118:24 out of context, but I doubt the book was written to explain the Psalm. The book emphasizes creation care by introducing children to the beauty of God's creation and encouraging them to appreciate nature. The only part of the book that disappointed me was the meager text about a lighthouse that accompanied the "Sunday" page spread. After reading This Is the Day!, you can't help but notice all of God's splendid creations and offer a thanks to Him for such blessings. Win a copy! Zondervan has kindly provided me with (2) copies of This Is the Day! to give to Brimful Curiosities readers. 2 WINNERS! To enter, browse Zonderkidz (Zondervan.com) and let me know the title of another book that appeals to you. BONUS ENTRY: Just for fun, leave a separate comment telling me your favorite Psalm or children's book based on a Bible passage. I took this picture last year after a threatening summer thunderstorm. Looks like this rainbow is trying to play ring around the tree. Hugs this Earth Day! Don't forget to enter my Earth Day related children's book giveaway. Today is Earth Day. The first thing you should do today is step outside and marvel at the beauty of nature. Then take a few more steps and do something, anything, to help protect and conserve that precious environment. Those of us who live in Wisconsin can proudly say that our state has been involved in Earth Day celebrations from the beginning. In 1969, Wisconsin Senator Gaylord Nelson came up with the idea for a grassroots campaign to increase awareness of environmental issues and the first Earth Day was celebrated in 1970. My kids are still pretty young but my preschooler can at least understand the basics of Earth Day. Today, if it is nice, we'll spend some time outdoors looking around at the plants and trees and talking about what we can do as a family to live a greener life. We'll read a few books about gardening, recycling and green living. And, I'll have my daughter fill in this simple TIME For Kids Enjoying Earth printable and ask her what she thinks is beautiful about Earth. What will you do on Earth Day? If you aren't participating in the TV Turnoff Week, "Share the Earth" with PBS Kids and watch some great Earth Day Specials, including Curious George, Clifford and more. Plant a tree for every book you read! With Eco-Libris you can balance out your books (and the trees that are cut down to make them) by planting trees in developing countries. We'll be donating to this cause on Earth Day, following Amanda's lead over at A Patchwork of Books. I like big, wide open, green spaces. Land covered with plants, flowers, and trees with blue skies above and butterflies fluttering around. My Brimful Curiosities blog header pretty much proves this point. Guess I'm more of a country girl than a big city girl. However, sometimes green areas - big and beautiful green expanses can exist in unlikely places. Peter Brown in his new book The Curious Garden , shows how. The Curious Garden is an inspiring story about a little red-headed boy named Liam who stumbles upon an abandoned railroad in the middle of gray, industrial city buildings. Curious, he walks up some stairs and onto the elevated railway bed and discovers a patch of unattended flowers and plants. Though not much of a gardener, he takes it upon himself to tend the greenery. The plants begin to flourish as do Liam’s gardening skills (he even sings to his plants and conducts research during the winter months). The garden spreads throughout the city, revitalizing the once very dreary place. The beauty inspires others lend their hands in creating a lush, green, magical park winding through the bluest of blue skies. This feel-good, join-hands picture book reminds us that it only takes one small person to do something remarkable and by working together with others amazing things can be achieved. The illustrations by Brown are quite simply magnificent and have a vintage feel to them. As if painting a fairy-tale, Brown takes a dark and dreary place and magically turns it a bright, cheery garden full of life. My daughter has expressed a lot of interest lately in plants since spring arrived. She very much enjoyed watching the garden spread through the book and after reading about Liam, really wants to start growing her own garden, weeds and all. 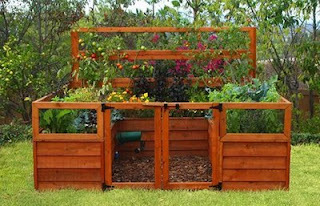 It is easy to envision this modern day “Secret Garden” filled with hard-work and hope. You can’t imagine how happy I felt after reading the back page of the book where I learned that there is such a place currently under development in New York City called the High Line. Some cities do offer a few neat green spaces. If you are curious enough you'll find them. 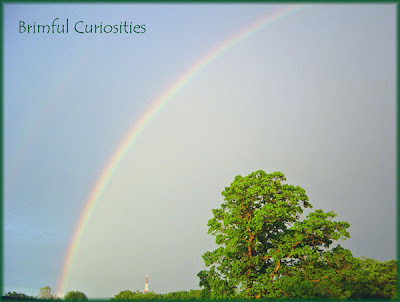 The Curious Garden - a wonderful Earth Day or any day read! Win a copy! 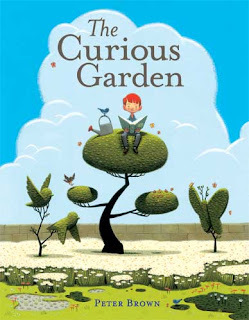 Hachette Book Group has kindly offered to giveaway (10) hardcover copies of The Curious Garden to 10 Brimful Curiosities readers. Yes, this is a HUGE Earth Day giveaway! Please spread the word. 10 COPIES! To enter, leave a comment telling me about your favorite garden or favorite children's book about a garden. TV Turn-off Week is Monday, April 20, through Sunday, April 26. To mark it, Family Life Blog be giving away a different book each day. Check the blog for details. TV Turnoff Week begins today. Here in the Brimful Curiosities household we plan to try and do the no screen thing all week long. I myself don't watch too much TV so it shouldn't be too hard for me. The kids do have a couple of shows they really like to watch during the morning so it will be a little bit harder for them, but not the end of the world. We've gone without TV often enough (usually the result of a lost remote). Did you know that American children watch an average of three hours of television per day? 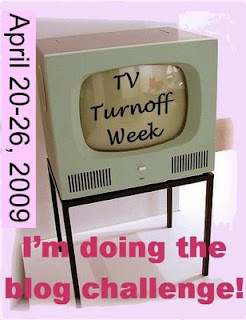 As part of TV Turnoff Week I'm taking part in 3rd Annual Turnoff Week Blog Challenge at Unplug Your Kids. As part of the challenge, we are going to try to read more books, play games, participate in imaginary play and, if the weather is nice, spend a lot of time playing outside. Manic Mommies - Book Giveaway Ends ?? By The Book: Caring For My Kids! National Library Week Tip #3: Don’t judge a book by its call number. Some books make great cross-overs, appealing to many different ages. I somehow ended up with a few canine followers on Twitter, one of which happens to be the fictional Chet the Dog. Actually, I’m a bit jealous of him after noticing that he has more followers than me. Can’t be helped I guess. He’s a pretty lovable character, right down to his mismatched ears. 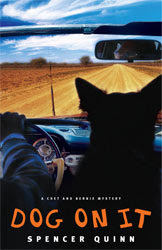 Chet manages well as the narrator and dog detective in the (Adult fiction) book Dog on It: A Chet and Bernie Mystery . His doggie insights made me laugh out loud many times, especially in the first few chapters. It has been awhile since I read a mystery novel, and this fairly light-hearted crime read by Spencer Quinn, written from a dog’s viewpoint, certainly amused me. Chet the dog and Bernie, his human partner, run their own PI business called The Little Detective Agency. Suffering from “cash-flow problems” they pick up a case involving a missing teenage girl named Madison. Both dog and owner get themselves into some pretty sticky, suspenseful situations. Cheerios on the floor and other dogs cause a few diversions along the way as well. A quick read with a mystery that’s not difficult to figure out – pretty much the perfect start to what looks to be a fun series. Dog On It reached #7 on the New York Times Best Seller list in March. This book could make a good YA cross-over, but unfortunately, in my opinion, it contains too much offensive language for YA readers. Fans of Braun’s “Cat Who” cozy series may especially enjoy this addition to the animal detective world. Win a copy! Atria has kindly sent me an extra copy of Dog On It to giveaway to a Brimful Curiosities reader. 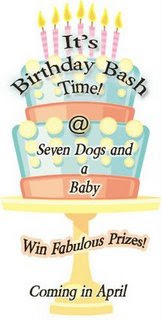 To enter, leave a dog-related comment (about Chet or any dog) on this post. 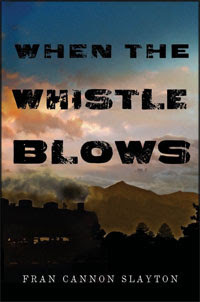 Or, let me know what you think Chet's next adventure should involve. • Contest ends on Monday, April 27th, 2009 at 11:59 PM CST. National Library Week Tip #2: Books aren't the only items available at the library. Be sure to check out the large range of audio and video selections, too. Here comes the sun … or rather a yellow creature from the sun named Gustafer. I always welcome sunshine in any form. 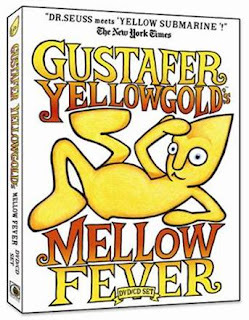 The new CD/DVD combo we recently received called Gustafer Yellowgold's Mellow Fever brings plenty of musical sunshine into our home with sunny songs that bring smiles to my children’s faces (and mine, too). Who is Gustafer Yellowgold? Apparently he arrived from the sun via a Sunpod, and landed in the state of Minnesota. He enjoys living in the cooler environment and making new, interesting earth friends like Forrest Applecrumbie, a Pterodactyl. He also loves eating pinecones and playing with his pets: an eel named Slim and a dragon named Asparagus. Musician/illustrator Morgan Taylor created Gustafer and tells his story through animated illustrations that accompany highly imaginative, original songs. Gustafer has been around since 2005, and I’ve been scratching my non-cone shaped head trying to figure out why I hadn’t heard of Taylor’s series until now! Mellow Fever is the third set of musical stories in the award winning children’s music series, the first two releases titled Wide Wild World and Have You Never Been Yellow? Warning – Highly Addictive Music loved by both kids and parents! The mellow tunes of Gustafer Yellowgold’s Mellow Fever mesmerize both my preschooler and my one-year-old. The DVD is a fun, animated picture book put to music where Gustafer Yellowgold’s escapades take center stage. The lyrics appear near the bottom of the pictures read like text in a book. We love the CD as well, as ours gets plenty of air time in the car. I’d have to say our very favorite song hands-down is the swingy “Melter Swelter.” Snow doesn’t last long around Gustafer; he melts it right up. Making snow angels and snowmen doesn’t exactly go so well. But, he uses his ability in generous ways, like helping free a turtle from the ice. In “Butter Pond Lake” Gustafer shares his memories of days on the sun, wading in a lake full of butter surrounded by darkening bugs. My daughter sings a beautiful rendition of the groovy “Getting in a Treetop” complete with her own made-up tree blowing arm movements. “Quite Easily Lost” featuring Sisson the blue worm and “Panther Stamp Pants” round out our favorites. I’ll admit Gustafer is rather unusual, but he is also quite heartwarming and also very amusing. If you take the time to watch and listen to the songs, you’ll discover that Morgan Taylor is a creative genius delivering messages in a Dr. Seussian sort of way. The music itself reminds me of the catchy, singable oldies (think Beatles) combined with soft rock, music that I listened to as a child while riding in the car with my parents. Morgan cites the bands Bread and America as influences; add WILCO to the list as well. After visiting the Gustafer Yellowgold upcoming shows, I happily learned that a performance will be coming to our area in May. Yay! Our family definitely plans to see this live. Win a copy! Gustafer Yellowgold has kindly offered to giveaway one Mellow Fever DVD/CD to a Brimful Curiosities reader. To enter, browse the Gustafer Yellowgold website and leave a comment telling me which song is your favorite. Our daughter's first Easter a few years back. Loved the Easter Bunny then, too. National Library Week Tip #1 - Involve your children in current events by reading and discussing books related to current news topics. Woof! Bark! A puppy in the White House! The Obama family has adopted a 6-month-old Portuguese Water Dog named Bo. Way back in November I reviewed a great book called Wackiest White House Pets. I'm posting my review again, with a giveaway this time! Wackiest White House Pets by Gibbs Davis covers an amuzing array of past presidential pets, from Jefferson's mocking birds to Teddy Roosevelt's chaotic "zoo" which included a one-legged rooster! Fifteen presidents and their pets are featured in this lighthearted read, each earning a special wackiest pet designation. For instance, George Washington's horses earned the "Cleanest Teeth" title while the "Luckiest Pet" went to Lincoln's lucky turkey pardoned from the Thanksgiving table. Hilarious almost cartoonish illustrations by David A. Johnson add interest to the text. My preschool daughter was slightly frightened by the sight of John Quincy Adams running away from an alligator on the cover. However, the book is meant for ages 7 to 10, so I imagine that age group would greatly enjoy the silly scenes pictured. The final pages of the book include a fact-filled listing of all 43 presidents and their respective pets. Most kids love pets. They'll devour this read, and quite possibly absorb some useful presidential facts while they are at it! Win a copy! Scholastic has kindly offered to giveaway (3) copies of Wackiest White House Pets to three Brimful Curiosities readers. To enter, browse the The Scholastic Store Website and leave a comment with the title of a "dog themed" book available for purchase on the Scholastic website.